Earlier in the year we wrote: "We are hoping to spend some time in Vienna this summer and intend to hire bikes for a few days". We have just returned from Vienna and we must be honest: We failed to fulfil our intention of hiring a velocipede or two to make the odd trip out into the woods and fields around the city. The friends we met there are not cyclists and so we decided that we would shelve our cycling plans in the interests of harmony. However we made some enquiries and kept our eyes open. The city has 1200km of cycleways, 30 000 bike park racks and over 100 City Bike pickup points. 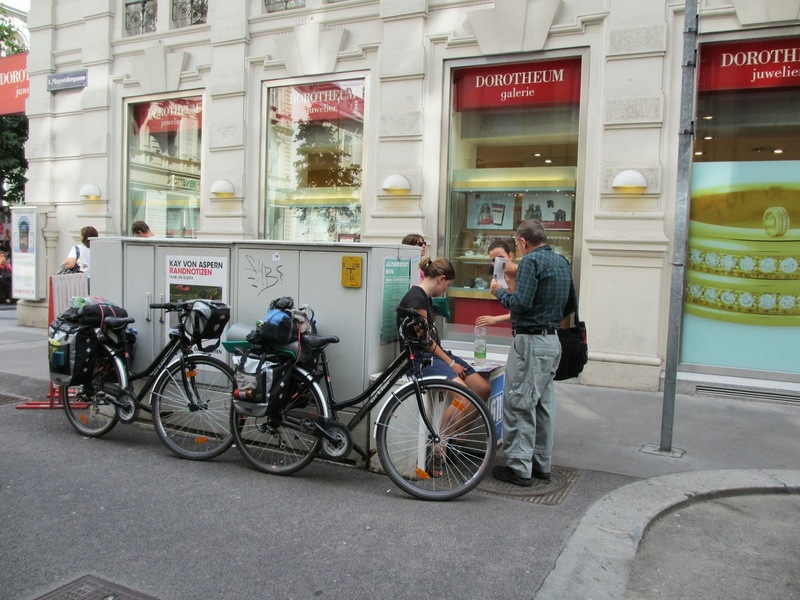 Obviously Vienna is not yet a cyclists' city like Amsterdam or Copenhagen, but it is well on its way. Without being unpatriotic it is farther down this road or cyclepath than London for example. However the city is not as flat as the two forerunners mentioned above. There is an excellent cycle map available free of charge from the tourist office, which is much better than the general city plan also given out by this organisation. There is a navigation app for cyclists which can be downloaded from the city's cyclist website: www.fahrradwien.at (in German, of course). The website also offers a route planner, a list of events and hints for cycling in the city. Public transport in the city is so good that I think if I l lived in Vienna I would be using this a good deal rather than cycling. If you are visiting Vienna in the next few weeks, it is worth nipping into the MAK to see an exhibition of classic bicycles called "Tour du Monde". You need to be quick though it closes on 6 October 2013. Neil discussing cycle routes in the city centre with two touring cyclists.